SD Series card printers (SD260, SD360) feature system-matched Datacard-patented ribbons that activate additional features exclusive to Datacard. Upon installation, the Datacard proprietary ribbons enable all enhanced product features that help you print high-quality cards more easily. When a genuine Datacard ribbon is loaded into an SD Series card printer, the driver automatically adjusts printer settings to match the ribbon type and helps ensure the best possible image quality on the cards. The printer and supplies then collectively track ribbon consumption and notify you of an upcoming ribbon replacement. Enhancements in SD Series card printing technology dramatically improve quality and sharpness of photos, graphics and logos by utilizing optimized print ribbons and user-adjustable image and color controls. New TrueMatchTM technology in SD Series card printers emulates Microsoft-based sRGB color space to seamlessly reproduce on-screen images onto the card. This provides better color matching and reduces the amount of color adjustments needed, creating less hassle for you. The SD Series printing technology can help eliminate waste with the ribbon saver feature. When printing with genuine Datacard monochrome panel ribbons, the printer advances the ribbon just enough to print the image. Datacard color panel ribbons save one complete panel set during each initialization, while Datacard monochrome ribbons can potentially double and triple the standard yield. To help you reduce waste and help the environment, Datacard ribbon cores are now biodegradable and engineered with EcoPure® additive. These new cores offer the same life cycle, performance and reliability as the previous model. Replacing SD360 card printer supplies is quick and easy in an SD Series card printer with a reloadable supplies cartridge with drop-in cleaning roller. 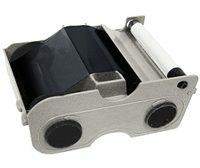 The cartridge includes a print ribbon and cleaning sleeve, and it snaps in place without the use of additional tools or adjustments. Simply open the supplies cover, use your datacard color ribbon and cleaning kit to swap out the old ribbon with the new one and resume printing. Regular cleaning operations will help you keep your SD Series card printer running at peak performance. Datacard Group offers cleaning supplies designed specifically for maintaining your printer and helps prevent mishandled cards, diminished image quality or damaged printheads. All ribbons are packaged as a kit and include all the necessary cleaning supplies. This package includes one adhesive cleaning sleeve and one isopropanol cleaning card. When more frequent cleaning is required, additional cleaning supplies can be ordered separately.